Huang Guan Yin, which name means "Yellow Goddess of Mercy", was first introduced in year 2003 after it passed the China Excellent Product examination. This fairly new tea from Wu Yi Mountain is slowly but surely gaining popularity due to its exquisite sweet taste and fine quality. Unlike most other Wu Yi Rock teas, Huang Guan Yin is processed using light fire and you may still find traces of green and yellow colors on its tea leaves. Try this if you enjoy Taiwanese Bao Zhong tea. Lovely honey-like peachy aroma and a strong floral aftertaste. We recommend starting with lesser tea leaves than you would normally use for Wu Yi teas, and then adjust from there. 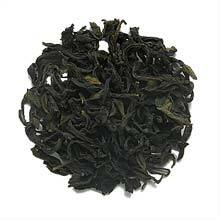 Dark curled tea leaves with traces of yellow and green color.